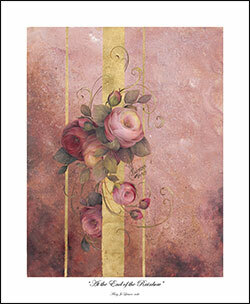 Description: Pink Roses wrapped around a band of gold leaf printed on canvas and ready to frame. The title is not displayed on the canvas. 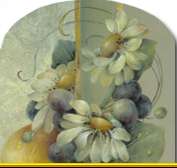 Description: This is a Giclee Paper Print. It is a row of 5 different apples. It is 6"x22" titled "Harvest Row" and is ready to be matted and framed. 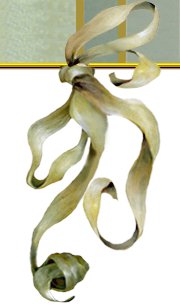 Giclee is a French word that describes the process of making fine art prints from a digital source. Description: This is a Giclee Print on CANVAS. It is on stretched canvas ready to frame. It is 6"x22" I am excited to have the Giclee Prints now available on paper and on canvas. These are of a wonderful quality. Description: Pink Roses on a Dark Background. This is a Giclee Paper Print 5"x22". It is ready to Matt and Frame.